Tom Albrighton has been a professional copywriter for over 12 years, writing for household names like Prudential, Jeyes and Fuji plus dozens of other businesses and agencies. He is a co-founder of ProCopywriters, the alliance of commercial writers, and was ranked the #7 `Copywriter rated by copywriters' in a 2015 DMA survey. As a writer or journalist, you may consider copywriting as a not-so-noble profession, when you accept to sell your gifts for producing well-paid but cheap stylish pieces of writing. But copywriting, and advertising in general, may mean much more than producing some advertorial content. A good work of writing has the power of changing the world, either it is read in less than a minute or more than 100-page long. Wherever you are using your skills, you are not wasting them, only using your words for a different aim, and sometimes audience too, and as long as you write well, there is nothing to be ashamed of. Copywriting Made Simple by Tom Albrighton offers an overview of the challenges and daily briefs a copywriter need to deal with on a daily basis. It is not aimed to someone completely new in the world of writing, but eventually to a professional looking for a career switch. The skills and knowledge in matters related to writing, there is only the need to understand how exactly a copywritter works and what his or her job involves on a daily basis. Otherwise, if you are already active into this field, the book doesn't help too much. Personally, I would have been interested in even more examples but also how to use your well-honed writing skills to persuade difficult clients unable to understand your work. In other words, it is an useful book, but it also has some limitations in terms of the reading audience. Noteworthy is also the list of bibliographical references at the end of every chapter, and the couple of exercices recommended. It makes copywriting simple, indeed, but in a professional way. 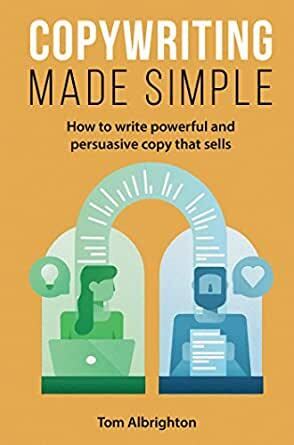 This book WILL improve your Business Copywriting skills! Copywriting is one of the most important skills to develop within a business. The messages we present to the world, defines our companies, our products and our services. The written messages (or copy) we present through company literature, sales material, social media channels and websites are the main mechanism by which we stay in front of our customers and partners. 'Copy' must be enticing, informative and generate action. I was very keen to read this book and explore new ideas or reinforce current approaches and strategies at an introductory level. While it’s very easy to say you’re in the marketing department you write catchy eye-grabbing material that will grow sales, or you write convincing funding applications or investor packs to raise money, we do need a process and plan to organise a structured and measurable delivery of your copy. If research has been done on how people respond to various approaches and techniques I want to know. If some techniques are known to work better than others I want to know. If there are major don’t dos, I want to know. This book provides answers along with the appreciation that we all need to find our own style and each project is different. The book is structured into 3 main parts: Plan your Copy, Write your Copy, and Improve your Copy. The first part in planning your copy was very much basic marketing activities that would typically be known before approaching a book like this. However, it was important to include this section for full coverage of the topic. The content was really about Know your Product, Benefits and Reader, and then Write the Brief. The second part of the book starts to deal with information that I was really interested in, how to write my copy and what I need to consider. While the information may not be completely new it’s important that we receive information that reinforces and brings structure to our task. The chapters in this section deal with Writing your Headline, Structuring your Copy and developing Calls to Action. The third part of the book is about improving your copy and delivers the real value of the book and the expertise Tom Albrighton provides. This part focuses on creativity, finding your flow, engaging your reader, being persuasive, using psychology and hitting the right tone. It challenges us to sharpen our copy by often killing our darlings and how to deal with feedback. The expertise shines through and the use of tables and graphics really help to present the information in more understandable and memorable formats. At the end of each chapter, there is a little TRY THIS section which is not a long extensive exercise but rather a simple thought-provoking query. I found these great because I don’t want to interrupt reading to spend hours doing some other exercise. There is also a substantial reference list with a total of 82 references in the book. I found the book really valuable for my needs and I would highly recommend it within the context that it is an introductory text, and I’m not a professional copywriter. Many thanks to Troubador Publishing Limited and NetGalley, for an ARC version of the book in return for an honest review. 3.0 out of 5 starsSome parts are too simple. The title does not lie, as far as simplicity goes. The first graphic shows this perfectly: a man (reader) crossing a bridge at the urging of a woman (copywriter), exactly as the text just said. It’s kindergarten level. Thankfully it doesn’t continue this way, once your intelligence gets over feeling insulted. The chapter on structure is amusing, because it perfectly mimics the steps I take to write a book, movie, or music review. Copywriting Made Simple is just that -- a simple way to learn the basics of good copywriting. This is a solid little book with a ton of great advice for anyone needing to write some persuasive text. The material covered would be beneficial to anyone who needs to learn how to sell, whether it be with words, images, or verbally. In fact, some of the sections were lessons I was taught as a clerk in a retail shop many years ago. Although this handy reference book might be too simplistic for many who have some copywriting experience, it's one I'd keep on my bookshelf for those times when inspiration is failing me and I need to remember to go back to the basics. Thank you to NetGalley and Troubador Publishing Limited for providing me with a free e-ARC of this book. Copywriting is my least favorite part of my writing career. But even though I'm mostly a traditionally published writer, I do have plenty of times I need to write short, snappy copy to promote something: me, one of my books, a speaking gig, etc. This book offers a comprehensive and accessible look at copywriting and how to become better at it. I've highlighted so many passages in my Kindle version that I think I'm going to have to just give in and buy the print edition! A great choice for reluctant copywriters.